Sadly, Phobos lost his battle with cancer and passed away on July 29th, 2012. 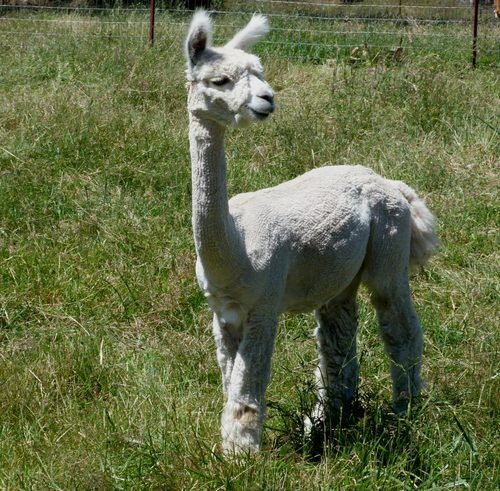 We will greatly miss Phobos, not only did he pass on incredible fleece qualities to his offspring, but he was also the first cria born on our farm. We will leave up his listing as a reference for his progeny and grandkids. RIP Phobos, you will forever hold a place in our hearts. Phobos is an exceptional full Bolivian! 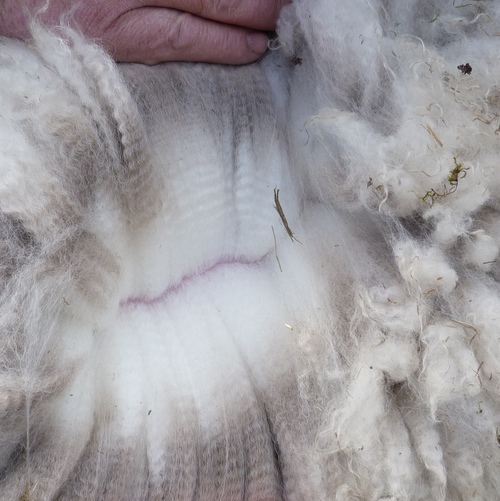 His fleece is beautiful; bright white, small uniform crimp and bundling, and extremely fine. His two year micron count was just 17.4! The fleece coverage and density on this boy couldn't be better. Phobos has strong conformation with heavy bone. He has an excellect bite for those females that might need a little extra help in that department. Phobos has a strong libido, yet can easily be handled. If you desire extremely fine fleece with fabulous character and great coverage, Phobos could be your Macho! 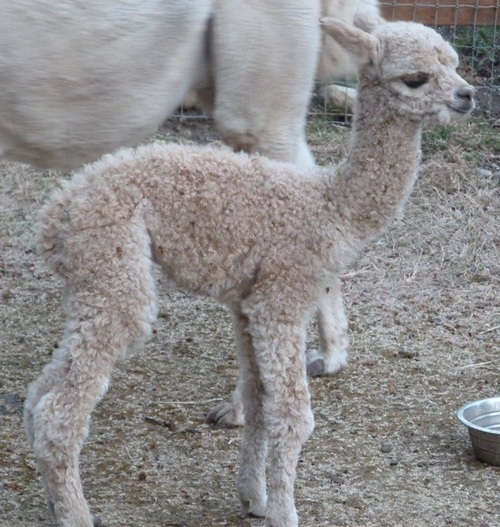 His crias are showing improvement over the dams in coverage (literally from nose to toes), fleece character, and bone structure. Phobos is truly an impact male! Please look at our full Bolivian Phobos son, Ayacucho, to add these incredible genetics to your herd! Finnegan has matured into a quite a handsome young male. We had held off on registering or showing Finnegan as we did not have breeding plans for him in our herd. However, as our herd has grown and we have added new bloodlines, we are excited have him service some of our girls and think he has what it takes to improve fiber characteristics in our herd. Finnegan has enthusiastically - and efficiently - stepped up to the task! Finnegan sports a compact frame and correct conformation. Fine fleeced with stand-out brightness and nice coverage. 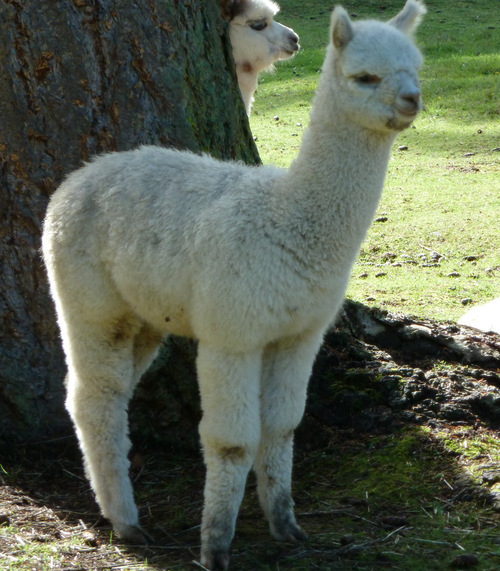 UPDATE 8/11/14: Finnegan's first offspring has arrived - a stunning fawn cria that has exceeded our expectations! 'Alladin' is covered in beautiful, long, curly golden fiber. While we expected an improvement in fiber fineness, we are delighted with the density, coverage and fiber character of this robust young male! We expect to add Alladin to our herdsire lineup soon. 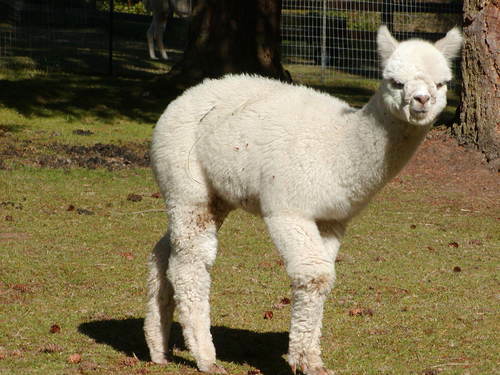 We anxiously await Finnegan's second cria - due in Sept 2016.